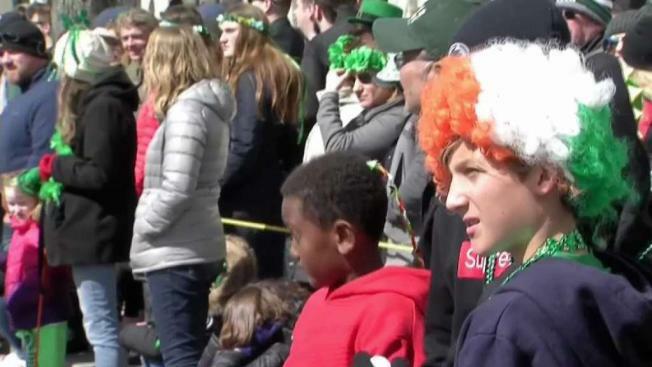 Thousands of people flooded the streets of South Boston to watch the annual St. Patrick’s Day Parade on Sunday. The parade kicked off at 1 p.m. and featured more than 100 groups, 24 floats and nearly 27 bands. Attendees had the chance to not only see marching bands and bagpipe players, but also UFC champion Conor McGregor, who threw hats into the crowd. "I’m here with my Irish people. I’m here with my family - my son," the Irish native said. "It’s his first parade on U.S. soil and it’s also my first parade. We’re just taking in the energy. It’s great to be here." The MMA fighter ended up being a big hit with the Boston crowd. 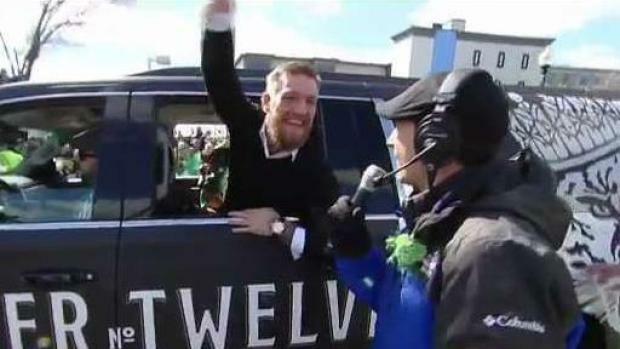 MMA fighter Conor McGregor made an appearance in Southie for the St. Patrick's Day Parade. "I screamed and actually melted," one girl said. "I'm still in shock from it. I love him." Another was equally excited, saying the best part of the parade was seeing McGregor go by. Others entertained the crowd, too, though, and politicians figured heavily in Sunday's parade, including Republican Gov. Charlie Baker and Democratic Boston Mayor Martin Walsh. Some of the politicians, like Sen. Nick Collins, Walsh and Baker, stopped by the necn booth to chat with hosts Matt Noyes and Latoyia Edwards. 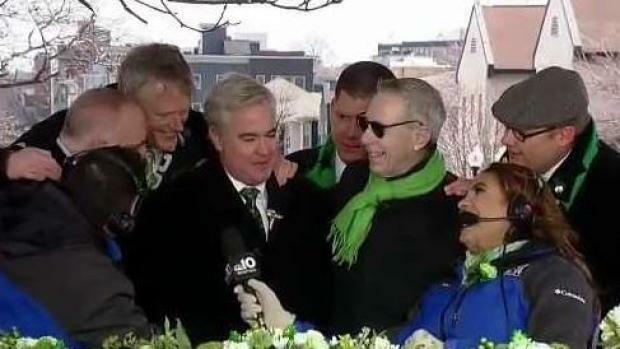 Massachusetts politicians arrive at the St. Patrick's Day Parade. Gov. Baker and Mayor Walsh join necn reporters Matt Noyes and Latoyia Edwards. Baker said he was thankful that there was no snow on the ground. Last year, the parade route was cut short due to a nor’easter. Some of the parade highlights included dozens of firefighters who traveled all the way from Galway, Ireland, to celebrate the festivities, giant Clydesdale horses, and dozens of bands like the U.S. Marine Corp Marching Band. 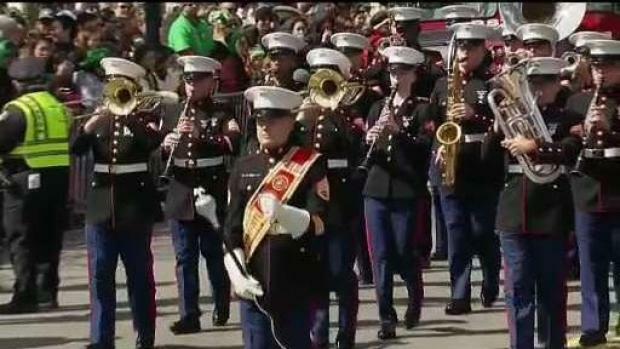 A U.S. Marine band marches their way through the streets of South Boston for the St. Patrick's Day Parade. 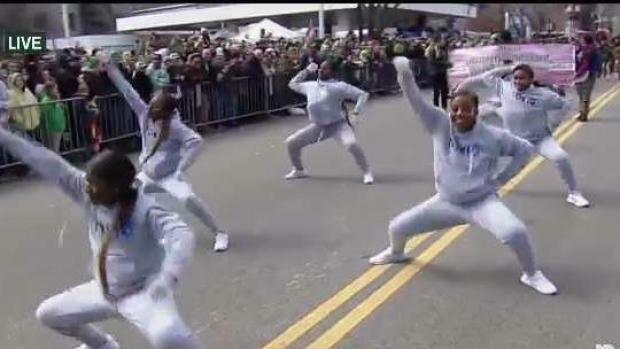 Additionally, the Toxic Majorette Dancers from Brandeis University and the Area 51 Majorette Dance Team wowed the crowd with their impressive dance skills. Boston police say they made three arrests during the parade, with charges ranging from disorderly conduct to a minor in possession of alcohol. Earlier in the day, Sen. Collins hosted the 2019 St. Patrick’s Day Breakfast at the Flynn Cruiseport on South Boston’s waterfront. Special guests included Walsh, Baker, Sen. Edward Markey, Rep. Ayanna Pressley, Rep. Stephen Lynch and more. Some memorable moments from the breakfast included a "Hamilton" inspired song and dance number and a special video message from former Vice President Joe Biden.